← What About Bob? What About Chiasmus? I’ve heard it said that 1986’s Big Trouble in Little China was ahead of its time. It introduced American audiences to Asian mysticism and style of filmmaking before they were ready to embrace them in a big-budget action film. With an estimated budget of $25 million, it only earned $11.1 million in the United States. Crouching Tiger, Hidden Dragon is often cited as receiving the credit that Big Trouble in Little China deserved. That 2001 film told a fantasy story rooted in Chinese culture, and it had a worldwide gross of $213.5 million on a $17 million budget. But I would argue that if any film is the natural heir to Big Trouble in Little China, it’s 2003’s Pirates of the Caribbean: The Curse of the Black Pearl. That film left both of the other films in its dust, earning a whopping $654.3 million on a $140 million budget. In Big Trouble in Little China, Kurt Russell plays a truck driver named Jack Burton. Through most of the film, Russell’s performance reflects the swagger and vocal inflections of John Wayne. After all, he’s playing an all-American hero in the middle of a foreign conflict, so it only makes sense for him to lay it on thick with an impression of the ultimate American macho man, John Wayne. 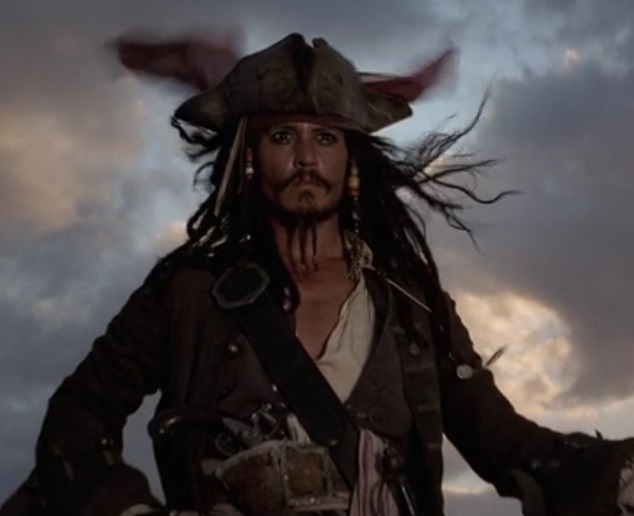 In Pirates of the Caribbean, Johnny Depp plays a down-on-his-luck pirate named Jack Sparrow. Depp patterned his performance after the mannerisms of Keith Richards, one of the original members of the Rolling Stones. Depp figured that pirates were the rock stars of their time, so he felt it was appropriate to imitate one of the most iconic rock stars of all time, and it created a unique and memorable character. In an ordinary movie, the love story would be a major focus of the plot. Instead, in both films the love story is treated as a strong motivation for the characters, but it’s usually hinted at for most of the runtime. Burton’s friend Wang Chi is set to welcome his fiancé to the U.S., but things go awry when some thugs (and later some mythical beings) kidnap her. For the rest of the film, Wang is obsessed with getting her back, and Burton tags along to try to help. 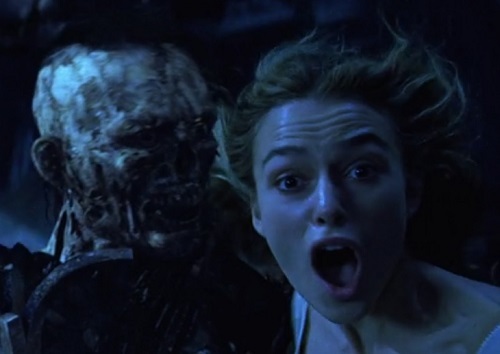 Will Turner’s secret love Elizabeth Swann gets captured by a group of undead pirates. Sparrow uses Will’s love for Elizabeth to get him to go to great lengths to rescue her while also unwittingly serving Sparrow’s own self-interest in the process. Wang seems like he should be the main character of Big Trouble in Little China. He’s the one whose girlfriend is at risk, and he actually has an inkling of what’s really going on while Burton is an outsider who gets dragged into this life-threatening situation by Wang. However, even though Wang is the seemingly more important character, we see most of the movie through Burton’s eyes and we think of him as the main character because he has a much more forceful presence than Wang. It would also seem that Will would be the main character of Pirates of the Caribbean because it’s his blood that the pirates need to break their curse and it’s Elizabeth who he is trying to save and woo. Sparrow is just along for the ride, trying to manipulate everyone to his advantage. But in spite of all this, Sparrow outshines Will and every other character in order to go from what should seemingly be a side character to the main star of the show by sheer force of will. 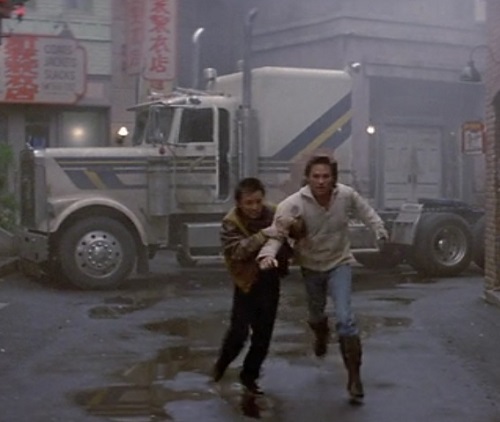 In Big Trouble in Little China, Burton has to abandon his truck and it falls into the hands of David Lo Pan, a cursed immortal man. 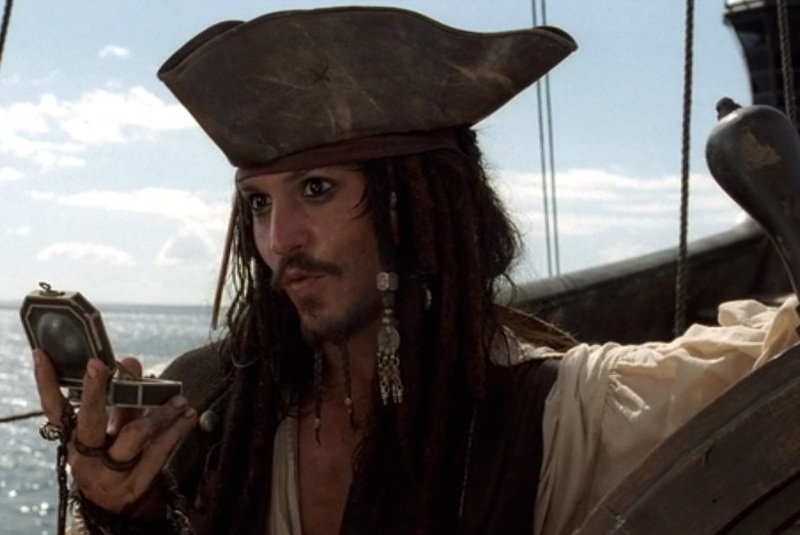 In Pirates of the Caribbean, we learn that Sparrow was the captain of a pirate ship called the Black Pearl. However, he became the victim of a mutiny by his first mate Barbossa, who later became cursed to live forever in undead form. So both Jacks lose their precious means of transportation at the hands of the main villain of their respective films. Burton has to have everything explained to him. He doesn’t understand what’s happening in the alley when two rival gangs start attacking each other and then when several godlike beings show up out of nowhere and appear to be unkillable. Wang tries to explain the ancient Chinese legends to Burton, but they mostly go over his head, even as he experiences increasingly bizarre supernatural events. Sparrow believes in the ancient Aztec curse immediately after his first encounter with one of his former crew members. Elizabeth, however, takes a little more persuasion. She doesn’t believe the ghost story Barbossa weaves as he tries to explain the curse to her. She has to see the undead pirates for herself in all their horrific detail to finally believe that she is actually in a ghost story. Lo Pan was cursed more than 2,000 years ago to be imprisoned in the body of a crippled old man or else to live as a disembodied spirit. Either way, he’s constantly in pain and unable to satisfy even the most basic of physical desires. The only way to break the curse is to marry a green-eyed woman and then kill her. This is what he hopes to do with Wang’s fiancé. Barbossa and his mutinous crew took a cursed Aztec treasure 10 years ago, and ever since they’ve been suffering as undead creatures. Barbossa hasn’t been able to enjoy the simple taste of an apple or the warmth of a human hand on his face, and it’s driving him mad. The only way to break the curse is to return every last piece of Aztec gold to its treasure chest, along with the blood of the man who took the first piece. This is what he hopes to accomplish through Elizabeth’s blood because he believes she is the daughter of that man. Burton and Wang try to sneak into Lo Pan’s underground lair, but they are soon spotted and captured. They manage to escape, but they are later forced to return for one final showdown with Lo Pan. The pirates take Elizabeth to their secret island where they keep all of their stolen treasure, as well as the Aztec gold. Sparrow and Will follow them into their underground lair, and Will manages to rescue Elizabeth while Sparrow is captured. 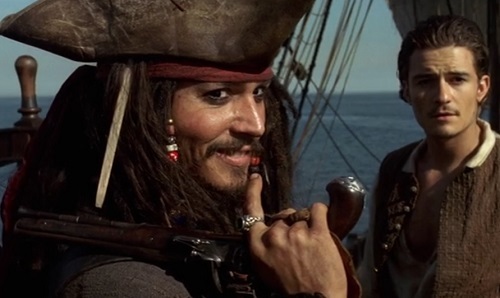 Later, Sparrow and Will both return to the pirates’ lair for one final showdown with Barbossa. During their initial escape from Lo Pan, Burton’s sort-of romantic interest Gracie Law stops to look at something strange. There’s an odd-looking statue against the wall and we see a pair of monstrous eyes hiding behind it. As Gracie looks at those eyes, the statue opens up and a hand reaches out and grabs her and pulls her down to meet Lo Pan. Lo Pan realizes she has green eyes, so he plans to marry her as well and then kill her while leaving Wang’s fiancé alive. This will satisfy the curse and also leave him free to enjoy himself. 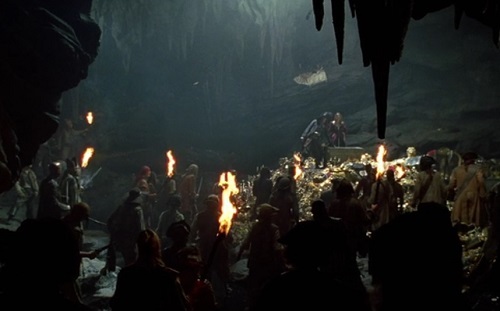 A similar scene takes place early on in Pirates of the Caribbean. During the pirate attack on her town, Elizabeth hides in a closet from a couple of undead pirates. They eventually spot her eye through a crack in the door and then open it on her. She demands they take her to their captain, which they promptly do. When confronted by Barbossa, she pretends to be the daughter of the man they’re seeking in order to satisfy the curse. Barbossa makes it seem like he’s going to kill her, but in the end he only cuts her hand, leaving her alive. On their first visit to Lo Pan’s lair, Burton and Wang find themselves in an elevator that’s quickly being flooded with water. They manage to get out and make it to the surface, but they quickly get captured. 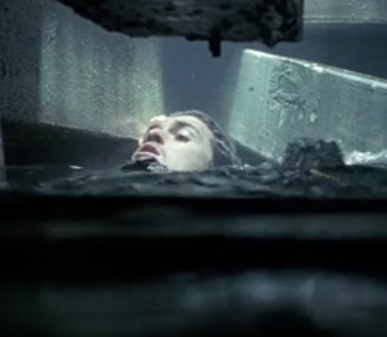 During an attack on his commandeered ship by the Black Pearl, Will gets stuck below deck as the ship fills with water. He somehow finds a way out and swims to the Black Pearl in order to give himself up as Barbossa’s prisoner in exchange for his friends’ lives. Burton and a group of warriors crash Lo Pan’s wedding ceremony, but they don’t attack right away. 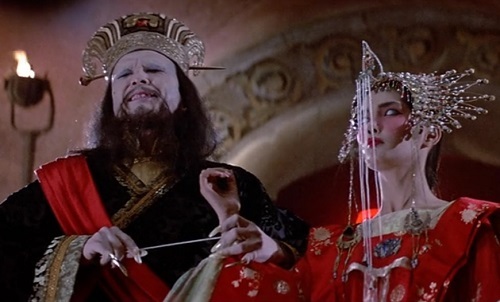 A wise old man tells an impatient Burton to wait until the right moment when the ceremony is complete and Lo Pan is mortal so that they can actually kill him. A big battle ensues. Joined by an entire ship full of British soldiers, Sparrow arrives back on the island in the middle of Barbossa’s attempt to spill Will’s blood on the Aztec gold. He tells Barbossa to wait until the opportune moment to complete the ceremony and become mortal again because if he does it right away he’ll be instantly killed by the British waiting outside. A big battle ensues. Burton finds himself alone with a newly mortal Lo Pan. He tries to kill Lo Pan with a knife, but he misses. Just as it appears that all hope is lost, Burton uses his lightning-fast reflexes to catch the knife Lo Pan throws at him and immediately send it deep into Lo Pan’s forehead, killing him. Sparrow duels Barbossa in an epic swordfight. At the end of this fight, Sparrow fires the single shot he had in his pistol, which he had been saving for 10 years, right at Barbossa’s heart in the instant that he becomes mortal again. Barbossa falls dead. 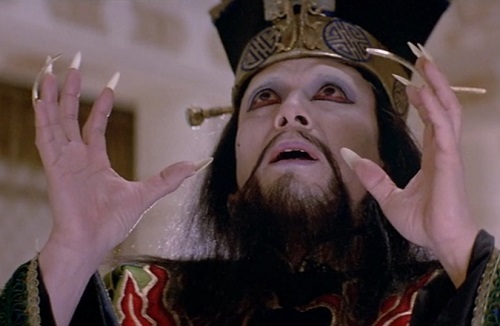 Right after Lo Pan dies, one of his underlings named Thunder is so overwhelmed by the shock of seeing his master’s dead body that he literally explodes. Right before Barbossa dies, Will and Elizabeth find a creative way of dealing with three of his underlings by shoving a bomb into one of their stomachs and forcing them out of the moonlight and into their human-looking forms. So they’re unable to get the bomb out in time, and they explode. Burton refuses to kiss Gracie goodbye or settle down with all the money he receives at the end of the film. He avoids the police and returns to the open road in his recently retrieved truck. Sparrow manages to escape from the British and he sardonically tells Elizabeth it would never work between them before returning to the Black Pearl. His crew informs him that he’s their new captain, and he relishes taking command of his vessel once more, guiding it to the horizon. As Burton is happily driving away, he doesn’t realize that he’s got a little surprise waiting for him in the back. The monster that kidnapped Gracie has stowed away underneath his truck, portending more misadventures for the poor trucker. At the end of Pirates of the Caribbean’s credits, there’s a little stinger involving Barbossa’s pet monkey. The monkey grabs a piece of the Aztec gold and suddenly returns to its undead form, portending future supernatural adventures. This is all quite remarkable, huh? One more interesting similarity is that both of these films represented a first in the realm of PG-13. That rating had just been created two years before the release of Big Trouble in Little China, and it was John Carpenter’s first film to receive that rating. Most of his films had been R before then, except for Dark Star and Starman. Pirates of the Caribbean was the first film released through the Walt Disney label that was rated PG-13. All of the studio’s films in the past were either G or PG. American audiences weren’t terribly interested in an Asian fantasy movie that didn’t star Eddie Murphy in 1986. Pirate movies weren’t exactly in vogue in 2003. Ever since 1995’s disastrous Cutthroat Island, pirate films were seen as box-office poison. But all it takes is one good film to revive a dead (or undead) genre. Plus, Kurt Russell and Johnny Depp weren’t yet A-list actors when they played their respective Jacks in these movies. Big Trouble in Little China became a cult classic when audiences returned to it years after its theatrical run and realized it’s actually a decent little film. Pirates of the Caribbean has had kind of the opposite fate. It received rave reviews and made tons of money on its release, but its star has dimmed somewhat after three (and probably soon to be four) disappointing sequels of diminishing quality. But the first Pirates of the Caribbean film still holds up today as an incredibly entertaining romp. 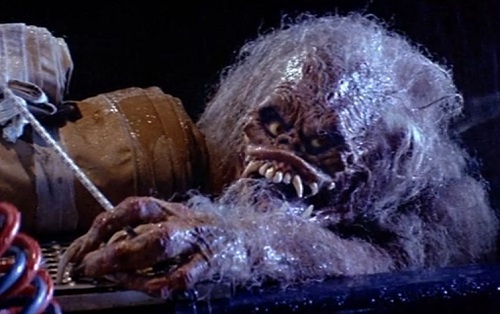 I don’t begrudge it copying Big Trouble in Little China. On the contrary, I praise it for shining a light on everything that worked in that film and didn’t get appreciated all those years ago. Now that we see that Pirates of the Caribbean works so well as a standalone film, going back and rewatching the film that inspired its success shouldn’t be any trouble at all. This entry was posted in Movie Matchups and tagged 1980s, action movies, big trouble in little china, fantasy, films, john carpenter, movie review, movies, pirates of the caribbean, relationships, romance. Bookmark the permalink.